In this landmark exploration of the origins of nationalism and cultural identity in China, Pamela Kyle Crossley traces the ways in which a large, early modern empire of Eurasia, the Qing (1636-1912), incorporated neighboring, but disparate, political traditions into a new style of emperorship. 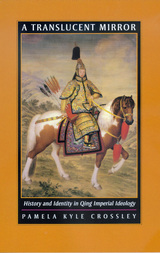 Drawing on a wide variety of primary sources, including Manchu, Korean, and Chinese archival materials, Crossley argues that distortions introduced in seventeenth- and eighteenth-century historical records have blinded scholars to the actual course of events in the early years of the dynasty. This groundbreaking study examines the relationship between the increasingly abstract ideology of the centralizing emperorship of the Qing and the establishment of concepts of identity in the seventeenth and eighteenth centuries, before the advent of nationalism in China. Concluding with a broad-ranging postscript on the implications of her research for studies of nationalism and nation-building throughout modern Chinese history, A Translucent Mirror combines a readable narrative with a sophisticated, revisionary look at China's history. Crossley's book will alter current understandings of the Qing emperorship, the evolution of concepts of ethnicity, and the legacy of Qing rule for modern Chinese nationalism. Pamela Kyle Crossley is Rosenwald Research Professor of History, Dartmouth College; author of Orphan Warriors: Three Manchu Generations and the End of the Qing World (1990) and The Manchus (1997); and coauthor (with Richard Bulliet and Dan Headrick) of The Earth and Its Peoples (1997).